A happy new year to everyone, I hope it finds you well and prosperous. That rather nasty stomach bug had me floored over the New Year so the girlfriend and I toasted in the new year with camomile tea and an early night. The second year running for the girlfriend. We watched the London Eye fireworks on the telly and then went for a walk on Wimbledon Common on New Years Day. I have officially become a fuddy duddy. So, what will the New Year bring? Well, it has already brought change to Monkey Gland HQ. Yet again I'm redesigning the site and thinking of changing the focus a little. I'm going to make the thing a little more biased to eating in London, a little more about living in London. Nothing drastic, I'm just going to use the fact I live in London as a starting point a bit more. you are just prepping to win the "Best City Food Blog for 2006" aren't you, aren't you?! I think that is a great idea. Maybe next time I'm in London you will have come up with a better place to meet than Gordon's Wine Bar. Looking forward to seeing the new Jam Faced unfold. Happy New Year 2006 to you. I've been enjoying your blog for the past 2 months, and you've written some very inspiring things. 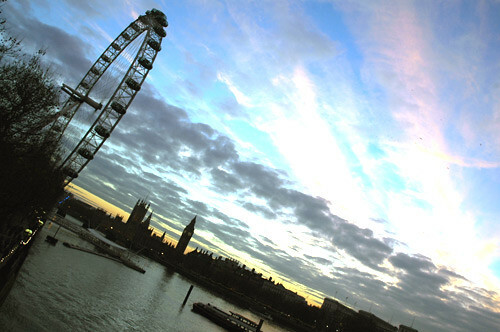 That photo of London Eye is wonderful. My partner and I went a year ago to London for a weekend, and we loved it. We went also on the London Eye for the first time. Such a diverse communities, great restos, cute shops, interesting neighborhoods, etc...I'd like to wish you many more interesting adventures, health and happiness in 2006. Cheers...well written and well-presented blog you have. Oh, this is nice! Looks a little journalism-y.